Outlook is one of the major components of Microsoft Office Package. Outlook is a personal information manager, and it has lots of uses for people. This is mainly used as an email application and using which you can send and receive emails on your Windows PC. It has a lot more things like Calendars, task managers, etc. If you are also using outlook for various purposes on your Windows computer, you might have come across Outlook Error 0x800ccc0f. 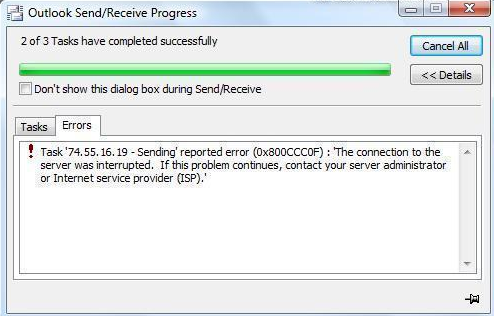 This is an unexpected Outlook error which indicates there is no connection to the server. It means you will not be able to send and receive emails in that situation. I know it’s difficult to face such situations. So, I am going to help you fix Error 0x800ccc0f in Outlook 2010/2013. To be simple in words, you will see this error message when you are not connected to the internet. That can be in different ways. Like internet connectivity issue on your windows computer and problems with the outlook server. If you are also facing the problem on your computer, you probably see the error message given below. You may not be able to detect the problem until you get that error code. The error message says the outlook is unable to send and receive emails in outlook. Let’s see how you can fix that issue. Believe me, I have working Outlook error 0x800ccc0f solution. All the solutions given here may not work on a single computer. But I am sure that you are going to fix the problem using any of one of the solutions here. Check which of them works for you. No internet connection or Limited Internet connection will not work to send and receive data. You will not be able to send the emails and receive emails if you are not connected to the internet. It’s crucial to check the internet connection on your computer before going to use the outlook. Following tips may help you fix internet connectivity issues. Restart the router of your Internet Service Provider. Disconnect and Re-Connect the LAN connection. Turn Off Wifi on your Windows computer and Turn it on and Get connected to the internet. Those simple steps will help you solve the problem. If this does not work for you, here is another solution that works for sure on any computer. Windows firewall will oppose you access the resources on your Windows computer and of course antivirus too. Disable the windows firewall and deactivate the antivirus for some time. Check if the Microsoft Outlook works without any issues on your windows 10/8.1/8/7/vista/XP. Follow few instructions to disable two of them. Go to Start Menu or Press Windows Key from your keyboard. Uninstall Anti-Virus on your computer. Try sending Outlook emails, and of course, you will receive the emails if everything is fine. Otherwise, you may have to open the Microsoft Outlook in Safe Mode. Configuring the POP/SMTP servers will fix the problem if everything else is fine. This can be the way you need to look up at last. Manually add POP server name and then SMTP server name. Follow the simple steps to finish this fix. Go to Microsoft Outlook >> Tools >> E-Mail Accounts. Click on View or Change Existing E-mail Accounts and then click Next. Click Add in the Email Wizard Box. Hit on POP3 and then Next. Add pop.gn.apc.org and click Next and Finish. Make sure that everything else was okay with E-mail Profile. Hope it works. Finally, you can Send/Receive the Emails in Outlook. Those are the impressive tricks that worked for me. Let me know if they don’t work for you. Thank you for reading the guide to fix receiving reported error 0x800ccc0f outlook 2007.